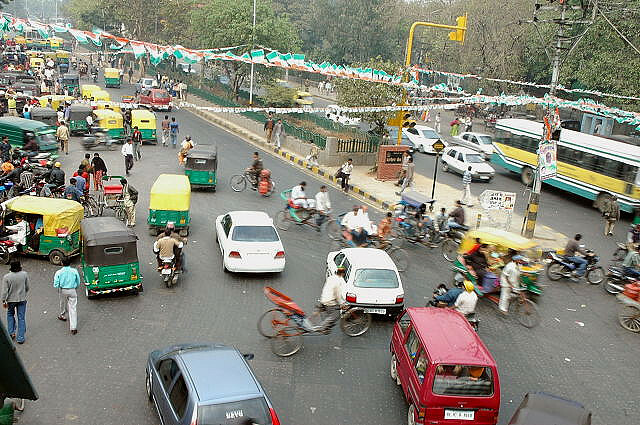 Developing cities like Delhi grapple with establishing organized public transport systems. Photo by Mani Babbar. This post was originally published on EMBARQ.org. FedEx will provide $1.4 million over two years to EMBARQ to provide technical expertise on sustainable transportation projects that improve quality of life in cities. This grant is a continuation of FedEx’s successful collaboration with EMBARQ’s Center for Sustainable Transport in Mexico (CTS-EMBARQ México), which began in February 2010 with a $500,000 grant to help Mexico City’s Metrobus optimize its vehicle operations. Through workshops, field visits and direct consultation, EMBARQ transport planners and FedEx global experts will team up to provide support to developing cities in fuel and vehicle technologies, vehicle asset management, and real-time user information systems. In addition, to prevent injuries and deaths from traffic collisions, the project in Mexico will work to train hundreds of bus drivers on key safety principles. In India, EMBARQ and FedEx will increase the technical capacity of city transport agencies to organize their bus systems, advising on areas like vehicle maintenance, procurement and technology, as well as data collection and management. “FedEx’s guidance will go a long way in helping Indian officials—from bus operators to bureaucrats—realize the significance that bus-based systems can play in alleviating mobility problems, including congestion, air pollution and unsafe roads,” EMBARQ India Director Madhav Pai said. In Brazil, urban and transport planners are working hard to upgrade urban infrastructure to manage the millions of visitors expected in Brazil for the 2014 FIFA World Cup and 2016 Summer Olympics. FedEx will work with EMBARQ’s Research and Practice team to create a decision support system for helping Brazilian cities choose the best fuel and vehicle technologies for new transit systems based on cost-effectiveness and environmental benefits. Finally, EMBARQ and FedEx have also launched the EMBARQ-FedEx Fellowship, a two-year program to equip promising staff in EMBARQ’s Mexico, Brazil and India offices with the tools and knowledge to make an impact within their respective cities. The fellows recently completed a 10-day training at FedEx’s corporate headquarters in Memphis, Tenn., where they received leadership and technical training from senior FedEx staff. The Fellows will go back to their home country and apply their knowledge to improve EMBARQ’s FedEx-funded activities, which may include trainings, research and on-the-ground sustainable transport projects. Moving Cars, Not People, on Delhi's Bus Corridor?